Investor AmRest Coffee SRB d.o.o hired LSG Building Solutions d.o.o. for the construction and equipping of the first Starbucks shop in Belgrade in the shopping center of Rajićeva. Works at Cineplexx in Thessaloniki, Greece, were completed on 13.12.2018. the cinema is open for visitors. Affirming the principle of a satisfied client, the goal of LSG Building Solutions d.o.o. is to fulfill his expectations in providing services. Following the needs of our clients, there was a need to expand our Team in Belgrade and therefore the need for a larger and more equipped office. After several months of work and an investment of over 4 million euros, 15.11.2018. the Cineplexx Big is open in the shopping center "Promenade" in Novi Sad. Lesnina which since its inception known as the leading furniture sales trend is planning to expand its successful story and after a long time open a new home in Serbia. Novi Sad will get the first department store of Slovenian Lesnina XXXL furniture in spring. LSG Building Solutions d.o.o. is with partner Elektro Dan d.o.o. contracted the project "RECONSTRUCTION OF THE TOURIST RESIDENT OF THE STANCIJA MENEGHETTI - BUILDING OF THE VILLA" in the part of the electrical installation works of strong and weak current. After Kragujevac, Niš, Belgrade, we also started construction on Cineplexx in Novi Sad and the construction of the new MX4D Cineplexx Delta City Hall in Belgrade. Collaboration with the Cineplexx group continues with the cinema Thessaloniki in Greece and Tirana, Albania. LSG Building Solutions d.o.o. has contracted construction and craft works as well as installer works on the project of the Gymnasium and Economics School Benedikt Kotruljević. The contractual amount of works is around HRK 14,000,000.00. The excavations were started in October. LSG Building Solutions d.o.o. started working on a modern residential and business building on Vračar in Sime Igumanova Street 37 in Belgrade. The project covers area of approximately 1.600 m2. There are 11 attractive apartments and 1 loft. The investor is Kliper Gradnja d.o.o. LSG Building Solutions d.o.o. has contracted the performance of KFC in Zadar and as main contractor. The contract is worth around 3.5 million kuna and the deadline is relatively short, three months. The works started in July and the planned completion of the works is in October 2018. The favorable geographic position of Croatia and our company's policy to encourage the production of electricity from renewable sources, our interest is also growing for the construction of photovoltaic power plants in Croatia. LSG Building Solutions d.o.o. has carried out fewer photovoltaic projects in several locations in Croatia. After almost 10 years since the first idea for the reconstruction of the Haus des Meeres was born, the time has come: The facade above the main entrance is to be completely glazed and moved forward. The striking tilted rooftop will in the future face outwards, instead of inwards. Works on the reconstruction of Lesnina in Sesvete were completed and from 28.06.2018. Lesnina is open to visitors. As part of the contracted works of reconstruction, there was Mömax which was opened on 13.06.2018. LSG Building Solutions d.o.o. started work on the Green Hill project at an attractive location Dedinje, Belgrade. On Thursday, 5.April, 2018. the ninth sales center Lesnina XXXL opened in Pula. Work on the HOTELS & RESIDENCES PUNTA SKALA - outdoor sports grounds has begun. The investor is Punta Skala d.o.o. The estimated project time is March 2018 - June 2018. Project description. In December 2017, LSG successfully completed the design&build contract for The BRIDGE project, first stage. LSG Building Solutions d.o.o. has completed contracted works for the execution of electric and mechanical installations for the reconstruction of the existing ERSTE BANK branch office at Zagreb Velesajam. Cineplexx in Parndorf, Austria was opened on15.03.2018. LSG Building Solutions d.o.o. with Lindner contracted the execution of electric and mechanical installations for the reconstruction of the existing branch office at Zagreb Velesajam. The company Investor Borik d.d. from Zadar engaged LSG Building Solutions d.o.o. for the reconstruction of electric and mechanical installations of 146 rooms in the Hotel Funimation. As a LSG group, we grew strongly in terms of content and turnover in the years up to 2015. This growth, for example, has given us the very successful track to the solar power plants, which are an important new part of our current portfolio. After we have completed the conversion in Salzburg in turn satisfaction, we received the follow-up order for Cineplexx Villach. In June 2017 we received the conversion of the Realgymnasium Alosianum. The construction phase of the course area will be rebuilt, classrooms in the EC, as well as a part in the 3rd OG in this section. Our scope is the entire high – and low-voltage installation. Work has been completed in August for the reconstruction of the existing building and the extension of the new depadance at Hotel Berulia in Brela. Works on Cineplexx Delta City have been completed. Cineplexx Delta City has 6 halls of approximately 2000 m2. In order to provide the customers with an even bigger offer, City Center One Split has expanded the existing center, which houses the IKEA Delivery Center of the well-known IKEA department and Carpet Center. After several months of work 31.08.2017 Cineplexx Villach is open. On 3000 m2 there are 6 auditoriums with a total capacity of 1,300 places. In line with our quality policy, constant development and the pursuit of new standards and norms, LSG Building Solutions d.o.o. carried out recertification in June 2017 according to norms ISO 9001: 2015 and ISO 14001: 2015 and new certificates were obtained. On Thursday the 29.06.2017 the foundation stone was placed for the production factory Anton Paar in Sijekovac in the municipality of Brod, BiH. Contract is signed for the complete technical installation with the company Projektgradnja d.o.o. for a Hostel Zadvarje. LSG Building Solutions d.o.o. has signed a contract with LESNINA H. d.o.o. for the electrical and mechanical installations works, on the Lesnina Pula project. LSG Building Solutions in Croatia has been contracted by Shape Tec a subsidiary of the highly successful Austrian company ANTON PAAR in Graz, as the main contractor for the production plant in Sijekovac, Bosnia and Herzegovina. After several months of work and an investment of over 4 million euros on the 20.04.2017 Cineplexx Big is open in the shopping center Big Fashion in Belgrade. We are contracted as a subcontractor by the Tehnika d.d. (Main contractor) to execute the mechanical installations, water supply and drainage in the hotel Berulia, Brela for 154 accommodation units, of which 150 are guest rooms and 4 apartments. As of 30 of November works will commence in the Albi Mall, Pristina Kosovo, of the Cineplexx cinema from Austria, where movie lovers be shown the latest movies in high-tech, "Real D 3D" and sound "DolbyAtmos". At this year's Croatia day held in Graz on the 4.10.2016, which is traditionally organized by the Croatian-Austrian Chamber of Commerce that was attended by many businessmen from Austria and Croatian. This time, the focus was on economic opportunities, investments, industry and EU projects. Among the clients who rely on our experience and quality in the field of shop renovation there are many international and Croatian customers. TGA Technische Gebäudeausrüstungs GmbH has received the order for a residential building in the Hirschstettner Straße 64 in 1220 Vienna. LSG Building Solutions Macedonia contracted the renovation of the MEP services of the Hotel Beton. The Hotel is located at an idyllic location on the Ohrid Lake in Macedonia and will be in function during the summer season. LSG Building Solutions Macedonia contracted the reconstruction of the surgery rooms and intensive care area in Ohrid, Macedonia. To further ensure customers a comfortable stay, City Center One West in Zagreb has completed the rebranding of the existing center. Phase 1 has been completed and the work on Phase 2 is still in progress. Making the buying experience for visitors more enjoyable, in City Center One East and West in Zagreb, were opened two new Food Court's! To maintain its leading position in the field of shopping centres, in existing the shopping centres City Centre One West and East in Zagreb, two new food courts will be constructed. Hotel Liburna on Korčula opens its doors for guests before the beginning of the tourist season in the beautiful newly restored hotel. LSG Building Solutions d.o.o. duly completed and delivered hotel Liburna with all the completed contracted works to HTP Korčula d.d. LSG Building Solutions d.o.o. has contracted the reconstruction of part of the shopping center CCO in Split - Foodcourt. The contract is worth about 0,5 million euros and the deadline for completion is very short, only two months. LSG Building Solutions DOOEL signed a contract on the 21.04.2015. as a major contractor with the City of Skopje for the project Pelagonija Skopje. In the seasons 2014/2015 and 2015/2016 LSG Group acts as sponsor for the SK Rapid in order to increase the awareness of our brand further. On home games of SK Rapid we are represented with perimeter advertising and a video clip on the stadium screen. On the 10.01.2015. LSG Building Solutions d.o.o. was awarded the certificate confirming that our company has developed and implemented the Quality Management System that complies with the requirements of international standard ISO 9001: 2008. The past efforts on all Cineplexx cinemas in Croatia, Serbia, Macedonia, Slovenia and Albania has once again proven successful with the completion and formal opening of the Multiplex cinema with 11 auditoriums in Cineplexx, SC Ušće in Belgrade! 10.03.2014. we have legally arrived on the soil of Montenegro with the registration of our subsidiary LSG Building Solutions d.o.o., Herceg Novi. Thus, we open the door to new challenges in another country in Eastern Europe! Past cooperation on all Cineplexx cinemas in Croatia, Serbia, Macedonia, Slovenia and Albania once again left a positive impression with Group Cineplexx and continued in Serbia SC Ušće in Belgrade. After lengthy administrative procedures the photovoltaic power plant Barban is in operation and connected to the HEP network on the 13.01.2014. thus illuminating part of Istria! After Split, Zagreb, Osijek, Kragujevac, Skopje and Tirana, LSG Building Solutions d.o.o. continued with its competence in the cinema field in Slovenia as a contractor for the Austrian group Cineplexx. Since we successfully finished the dormitory „Base 22“ at the end of 2013 in the 22. district, LSG Building Solutions got appointed as well the electrical installations by Strabag AG in this kind of category. We were contracted with the electrical installations for the health competence center MARS with an effective area of 25 000 m². Our client is GESIBA, which is a charitable land settlement society and a construction company. LSG Building Solutions GmbH is proud to make a contribution to the modernisation and enhancement of the hospital Rudolfsstiftung. Manner, you just like it! We of course too. We have been awarded with the complete building services for the Manner underground garage by GRANIT Bau. The Project is situated on the Manner-Areal in Hernals, the 17th district of Vienna. We have been contracted by RHM GmbH with the HVAC & Plumbing work for the apartment complex ATLAS Geymüllerstraße. The current project was the winner of a planning an architectural selection process. LSG Building Solutions d.o.o. started as a EPC contractor with the preparation for the construction of the PV-Plant in Barban. The planned overall capacity is 1 MW, of which 570 kilowatts be realized in the first phase and 430 kilowatts in the second phase. From May 27th to 28th 2013 the Annual Installation Entrepreneurs Expo Conference was held at the JW Marriott Bucharest Grand Hotel. The "CONTRACTOR 2013"award honours the most recent examples of good practice in design, in execution and entrepreneurial management in the installation business. 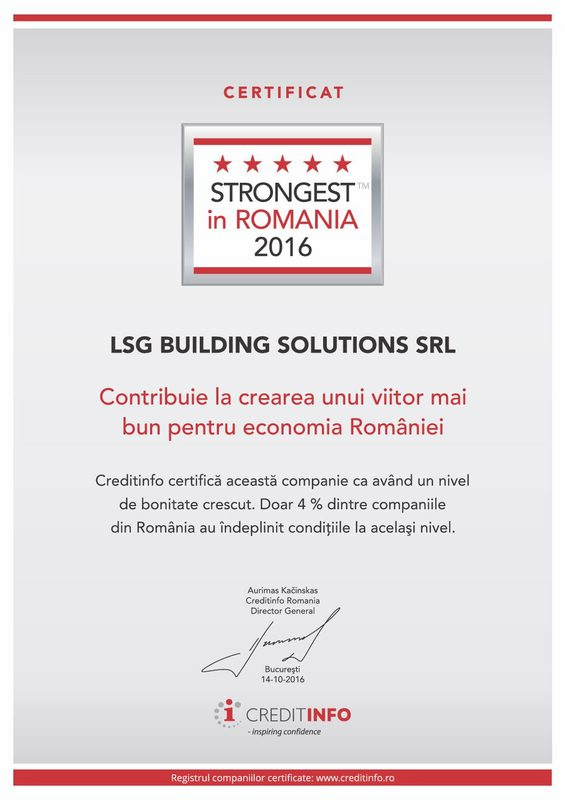 LSG Building Solutions DOOEL Skopje in cooperation with LSG Building Solutions d.o.o. Zagreb and the LSG Group GmbH Vienna won the international tender for the erection of the Ministry of Finance, Republic of Macedonia, in Skopje and signed on 16th April the EPC-contract. Porr Deutschland GmbH hired LSG Building Solutions GmbH to realize the electro-technical installation for BMW AG's new Berlin dealership. LSG has signed the EPC-contract to start construction for a 20MW photovoltaic power plant in Giurgiu, near the village of Izvoarele. The project called „Beta” after the investment company „LJG Green Source Energy Beta srl” was developed by LSG and its partner Green Source Consulting GmbH from Vienna. In the last year we decided to execute a complete restructuring of our corporate structure including the changing of our operating name and thereby our new name reflects the significant expansion in our business activities. On 28.06.2012 FCC Sky Tower (the highest building in Romania) reached its maximum point – 137 m. For this Occasion investor, developer and general contractor organized a ceremony to celebrate this event. Finally, the third centre of the success brand „City Center One“ goes in operation. With an overwhelming opening ceremony and an unbelievable public rush Prof. Wolfgang Kaufmann with partners opens his third centre in Croatia. City Center One is thus the unassailable number 1 in the retail sector of Croatia. In the Kragujevac Plaza the opening ceremony of the new Cineplexx location occurred on 20.03.2012. LSG supplied the electro technical services for one of the most modern cinema locations in Serbia. LJG signed a contract with Marriott for the installation of the new ventilation system for the new Cupola-restaurant in the JW-Marriott Hotel in Bucharest. The restaurant is completely refurbished and with the new concept aiming to be the best steak restaurant in Romania.